Can I install two face vises in my workbench? My bench is more than 7 ft long but it does not have space for an end vise. I have already installed a vise near the left side of the table, but it does not give me the option to clamp long pieces. I am thinking of adding another vise a little to the right side so that long work pieces can be supported fully. Is this is a good idea? If anybody has tried this, please share your experience. Thank you. Would a deadman or board jack or some holdfast holes in the right leg work? Anyway, I found a solution to the problem. 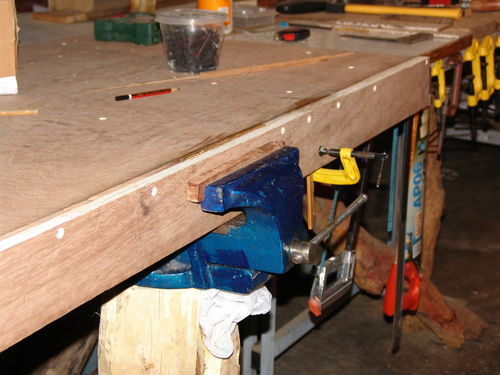 Instead of investing in a new vise, I converted my old 8” metal working bench vise by adding wooden facings and mounting it below the table height on a sturdy log. The set-up is shown in the picture. Now I have clamping capacity at both left and right ends of the table.